Gold Rally began its life as one of the most popular land based arcade and casino games in the United Kingdom. It is most rare indeed that an offline slot can become an online sensation but Gold Rally has managed to do with considerable effort. Indeed, Gold Rally can be found in most UK online casinos, as well as all the major sports books from Bet365 to Bet Fred, to William Hill and casinos such as Europa Casino, Online Casino Plex, City Tower Casino and Online Casino Tropez. So what is its allure? Could it be the expensive wager charge? It does cost £2 to play after all, at a minimum. If you use all 8 pay lines, which you will need to win the jackpot, it will set you back £16 a pop. So it can't be the stake prices then. How about the progressive jackpot? With the current figure resting around the £400,000 mark, I feel safe in assuring you that it is quite probably this jackpot that has made Gold Rally such a successful slot in recent years. Okay, well how do you win it? The symbols on the reels are divided up into Scales, Gold Rally icons, Horse Shoes, Pick Axes, Lanterns, Dynamite, Mine Carts, Bags Of Gold and Revolvers. Yes the theme is a Gold Rush in the Wild West if you haven't guessed it by now. Collecting nine scales win you the grand jackpot with a minimum of £75,000, whilst collecting four dynamite in each of the games for corners entitles you to the bonus game. Combinations of less than nine scales gives you prizes of between £200 and £5. Three Gold Rally symbols will entitle you to £500, whilst three Horse Shoes, Pick Axes, Lanterns or Revolvers wins you £200, £100, £75, £50 respectively. Should you find yourself equipped with 3 Mine Carts, 3 Bags Of Gold or 3 Scales, you'll net yourself £40, £30 and £20 accordingly. Lastly, 3 Dynamites, 2 Horseshoes or 1 Horse Shoes sees you bag yourself £10 for the formers and £2 for the latter. When it comes to the Bonus Game, you'll reach a map where you must pick two of six available digging spots. What you get, depends on what you select, but you're guaranteed to pick up something from the upturned dirt, so getting four Dynamites is never a bad thing! 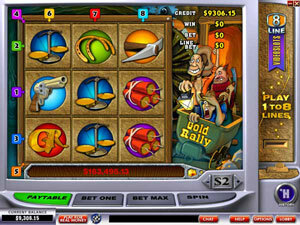 It is true that playing Gold Rally could turn out to be quite pricey, and that other online slot games could offer you a potentially grander progressive jackpot, and at lesser stakes; but they don't offer as many different combinations to win, and so for those of you that can afford it, Gold Rally is a great chance to bag a possible mammoth jackpot. Whether you take up your pick axe, and begin your quest for Gold though, is of course, entirely up to you!